The Wine Thieves are three friends Avto Kobakhidze, Givi Apakidze and Zaza Asatiani who have come together to take other people’s wine and sell it under their own label. Their catchphrase is “The finest quality Georgian wine ‘stolen’ exclusively for you,” although nothing is actually ripped off. If they like a wine from a person with no resources to bottle his or her own vintage, the Thieves buy it at a price set by the winemaker, then bottle and sell it. Kobakhidze and Apakidze make the wine selections. 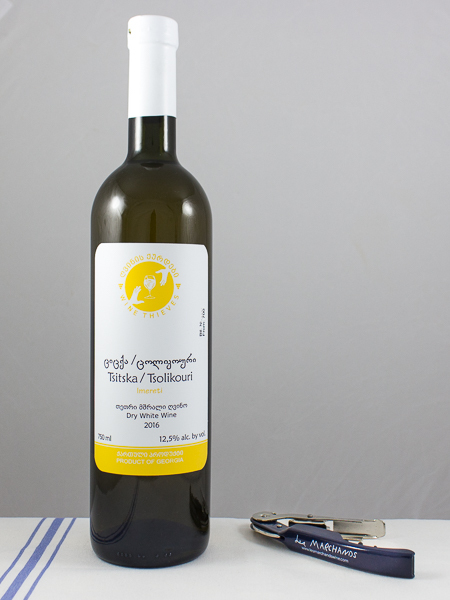 The two connoisseurs are co-founders of the Georgian Wine Club, which for ten years has been promoting traditional methods of local winemaking through festivals, tastings and classes. Contracts with the winemakers are short-term. The aim is to help family wineries learn to market their own wine. And because organic wines in particular can have a bad year, the Wine Thieves are free to add or drop a wine, depending on its quality. What you get in a bottle is some of the best tasting secret stash in Georgia.